Then I actually thought about it and started actually remembering the first ride. First of all, before we ever got on, I looked like I had ants in my pants. Seriously. I was so excited I was dancing around. I called dibs on Front Outside Left months before, so I claimed my rightful seat there, and Mom sat next to me. Once in the seat with restraints ready to go, my mind started racing. As we rolled from the station and into the launch room, I cleared my mind for a moment, and allowed myself to enjoy what was about to happen. I was about to ride a steel coaster that my family and I chose to build. All of the agonizing over the name, our announcement video, and every little thing led to this moment. Mom and I exchanged an excited, but nervous glance, grabbed hands, then placed them back on the restraint, knowing the launch was coming soon. Then the LSMs catapulted us forward, and I knew I had nothing to worry about. It is such a good launch. I kept waiting for the intensity to stop, but it didn’t. Before I knew it, I was staring at the Indiana skyline upside-down for the first time ever (of course, I didn’t actually realize this until the second time around). That’s when more thoughts started creeping in. I finally realized I would have all the rides I could possibly want to analyze this coaster, but only one chance to enjoy my first ride. So I shut the analytical part of my brain down for a second, took a breath of the spring air, and enjoyed it. I enjoyed that the ride was beautiful. That this is going to be a hit. 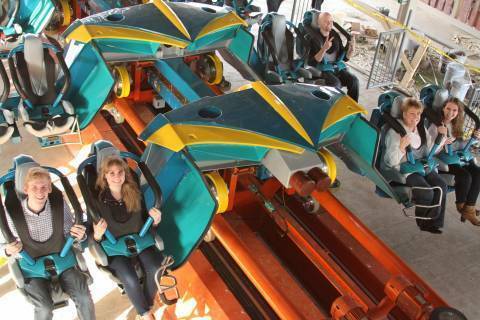 That all of our hard work is about to pay off when our first Guests get to ride. That my family and I have worked so hard and endured so much, and finally our greatest tribute to my father is reality. I snapped out of these deep thoughts in time to analyze the fly-through barn (it did not disappoint), and roll into the brakes. Another awesome post! Thank you SO much for sharing your first ride experience with us! 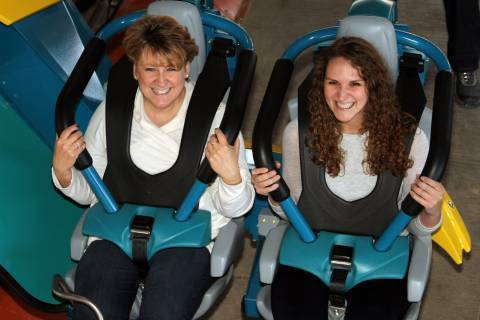 I can only imagine that the emotion and thoughts in your head were almost overbearing during this ride, and probably very personal… So I thank you for sharing that with us! I CANNOT wait to tackle this beast! Oh and btw, I NEVER doubted your choices for name, colors, theme, coaster type, or anything on this project. I didn’t have to! You guys have nailed EVERYTHING so I have no worries that it will be my #1! Your father would be so incredibly proud of you guys. Know that he is looking down from heaven with a huge smile, tears of pride and joy, and geeking out in his head over all the tech you guys have uses to make this things work! Of course us here on earth know that all it really took was some “Will power”!